In 332BCE, a Greek military leader named Alexander the Great led an army into Egypt. For nearly two centuries at that time, the ancient land had been under control of Persia, a powerful empire in western Asia. As Alexander’s army defeated the Persians, the Egyptian people welcomed Alexander. Some Egyptians even worshipped the Greek general as a pharaoh. 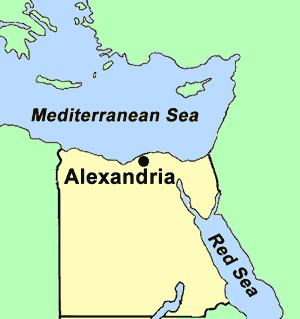 Alexander soon left Egypt to continue his conquests, but before leaving, he established a new capital named for himself on a port city in the Mediterranean Sea. This city called Alexandria became a center of trade between Egypt and other cities in a growing empire. The Greek rulers who succeeded Alexander constructed the greatest library of the ancient world in Alexander’s capital. The Royal Library at Alexandria collected books from all over the known world and attempted to gather all of the world’s knowledge in one place. Because books had to be copied by hand, they were very rare before Johann Gutenberg invented the printing press about 1450CE. Legends say that books were seized from ships sailing into Alexandria’s port. Scribes at the library then copied the books manually. The library would keep the original volumes and returned only the copies to their owners. The Royal Library at Alexandria was housed in many buildings, but many of those buildings were destroyed over the next nine centuries. The final destruction of the library appears to have occurred in the seventh century of the Common Era. A modern library, the Bibliotheca Alexandrina, was constructed in Alexandria in 2002. Similar to the ancient library’s mission of pulling together all knowledge, today’s version houses a copy of the Internet Archive, a vast computer collection that attempts to keep a record of nearly anything ever posted on the Internet. You can access the Internet Archive and see archived copies of what websites looked like in the past at www.archive.org. 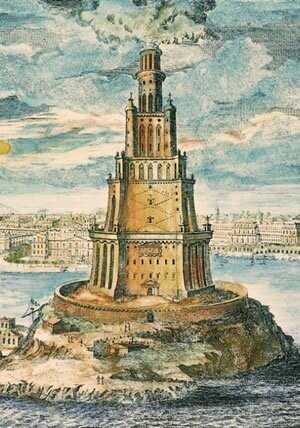 Regarded as one of the Seven Wonders of the Ancient World, the Lighthouse of Alexandria was constructed between 280 and 247BCE. For many centuries it was one of the tallest man-made structures on Earth. A section of Placido Costanzi’s Alexander the Great Founding Alexandria (c. 1737). 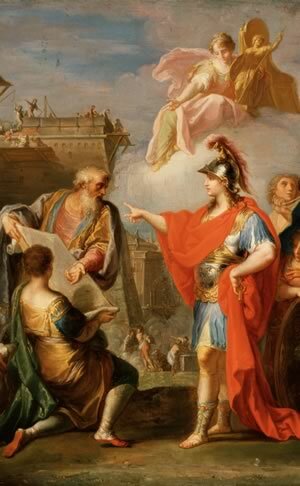 In this image, the young military leader gives instructions to the Greek architect Dinocrates. 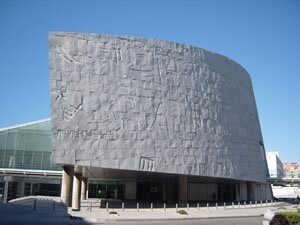 The Bibliotheca Alexandrina is located on the shore of the Mediterranean Sea. It is a commemoration of the Library of Alexandria that was lost in antiquity.